Arrival at Sofia airport. Meeting and departure to the riding center in Ihtiman. It is located in Sredna Gora mountain, 48 km from Sofia, and is reached by highway for about 30 minutes. As it is typical for most Bulgarian cities Ihtiman as well has a very long history. Its geographical position made it in ancient times an important point on the main road between Europe and Asia. In it has been engaged lots of military campaigns to Thracians, Celts, Romans and Slavs tribes. Thracians are ancient tribes inhabited the Balkan Peninsula since the mid II millennium BC to the VI century BC. Their culture and religion are still hiding many secrets. What is certain is that the horse had a special role in their life and their religion. Horses and horse remains were found in Thracian tombs. A cult of the Thracian horseman occupies an important place in the religion of the Thracians. Accommodation in the holiday base. Welcome drink. 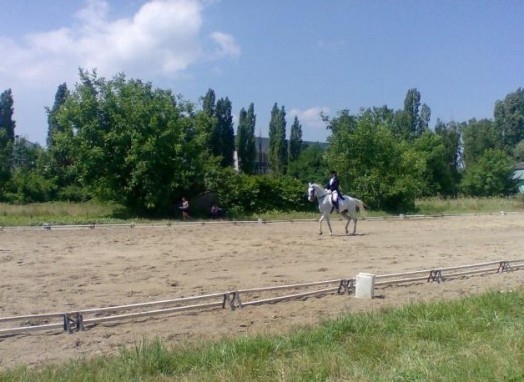 Introduction and familirization withthe horses and riding test. Breakfast. Starting the horseback riding in Sredna Gora mountain direction along the Topolnitsa dam. Sredna Gora is relatively low mountain with soft rounded shapes and a broad ridge. The highest peak is 1604 meters high (Great Bogdan peak). Its length is 285 km. The highest parts are covered with vast pastures and hills in the middle and lower parts are covered with venerable beech forests. Around noon arrival at the holiday base situated on the shore of the lake Topolnitsa. Accommodation and lunch. Topolnitsa is the largest lake in Srednogorie. The area of the dam at maximum payload is 9.6 km2. The capacity of the reservoir (at a level of safety) is 141 mln.cub.m. The wall is 78 meters high. Topolnitsa is long and narrow lake with many convenient locations for fishing. The lake is rich in fish - babushka, perch, bream, bleak, maple and slanchevka, carp and silver carp. Afternoon peaceful relaxation on the coast, and opportunity for the fishing lovers to try their luck. Dinner with fresh caught fish. Breakfast. Transition with the horses from Topolnitsa lake to village Muhovo. Muhovo is located next to the lake "Topolnitsa" 464 meters of altitude.It is surrounded mainly by beech forests . Near the village are kaletata Moriah, Pandova Kale and Lyubnishko Kale. In the vicinity of village Muhovo can be picked mushrooms, herbs, wild strawberries, raspberries, blackberries, briars. Arriving around noon. Accommodation and lunch. During afternoon watching animals in hunting farm and visiting historical sightseeing in the area. There are numerous remains in Sredna Gora mountain by the time of the First and Second Bulgarian Kingdom - ruins of castles, fortresses, bulk rolls, villages and monasteries. Much of the medieval Bulgarian military facilities and defense fortifications inherited ancient Thracian, Thracian- Roman and Byzantine fortresses. There were built and many new, mostly related to the defense of enemy incursions from the south. Somewhere along Mativir (along Muhovo) was Bulgarian stronghold Moriah. Three castles are located near Lesichovo: Kale, Gradishteto and the Fortress. Breakfast. Transition with the horses from Muhovo to Panagyurishte. Panagyurishte is situated at the foot of Sredna Gora mountain 523 meters above sea level. The village was founded in the XII-XIV centuries, but a number of archaeological monuments testify to the Thracian tribes lived in these places since antiquity. World renown has the Panagyurishte Thracian treasure dates back to the Hellenistic Age IV - III century BC consists of nine vessels with rich decoration, made of pure gold and weighs 6 kg and 164 gr, the Amphora-rhyton is the largest vessel , 7 rhytons - 3 in the shape of animal heads, 1 as protons (anterior part of body) of a goat, 3 females and 1 phial heads. Panagyurishte had a central role in one of the brightest and awesome moments in the history of Bulgaria - April Uprising of 1876 - the high point of the national liberation movement of the Bulgarian people. After lunch, visiting the Historical Museum. There is kept a copy of the Panagyurishte gold treasure. Viewing of the house-museum "Raina Knyagina", Dudekov house, Tutev house, Lekova house and historical monuments in the city that has experienced its star moment during the April Uprising, when it was declared the capital of Bulgaria. Visit the Winery Rumelia, introduction with the wine production and a three-tier wine tasting of red and white wines, among them a variety of Thracian‘s wine created since more than 2,000 years. Dinner in a typical Bulgarian restaurant. Breakfast. Transition with the horses from Panagyurishte to Topolnitsa. Lunch at Poibrene in the house of Maria Tsintsarova. She gives many years of work in the local community center. After her retirement she opens the only guest house in the village, its aim is to show them Poibrene‘s habits and manners of life. There she meets her guests with fragrant Poibrensko cheese cake (type of cheese pastry made with yeast). By Maria Tsintsarova can be learned stories for the nearby Fortresses. Some of them are from Roman times, others - from the Middle Ages. The most famous among them is Shishmanovo Kale, on which was named one of the hamlets in the village - Shishman neighborhood. To this fortress has related a legend of a girl who has jumped into the river, so as not to be enslaved by the Ottomans. And because the water in the river become muddy from her blood - hence the name of a river - Mativir. Visit medieval castles near Poibrene. Breakfast. Transition with the horses from Topolnitsa to Ihtiman. Parting with the horses and departure to Sofia. Hotel accommodation in the city center. Sofia is a city with a history that continues over 5000 years. During its long history it has had different names: Serdika ,Sredets, Triaditsa and Sofia. Tour of downtown: St. Sofia church dated V-VI century, which gave the present name of the city, Alexander Nevsky Cathedral with its gilded dome and the permanent exhibition of icons in the crypt, St. George Rotunda III-IV century, remains from the walls. Breakfast. Morning free time. At 12h 30 departure from the airport. If you are tour operator / tour agent please contact us for details and conditions.